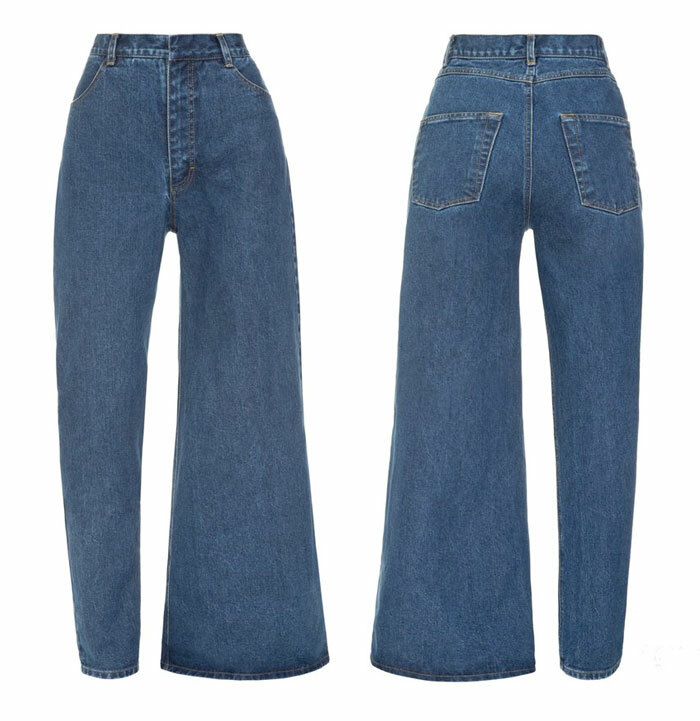 The latest spectacle I’ve seen lately is a new asymmetrical jean “trend,” where one leg resembles more of a straight style and the other looks like something grafted in from a piece from JNCO. They appear to be a style only available as a preorder from one brand at this time, Ksenia Schnaider. I’m sure they’ll sell just like the others, although it’s still perplexing when every public comment on social media suggests otherwise, every time. I do realize that those negative comments also flood new releases of more understandably popular styles as well, but demographics play a huge part. If these jeans sell, these brands will continue to come up with new outlandish designs. But as the old adage goes, all publicity is good publicity…at least the brand’s name is now well known right? For every twenty people laughing, there’s one new person who might buy something else from the brand or become a fan simply because of an appreciation for their ability to shake things up a bit and cause a rise out of unsuspecting social media goers. I’ve also noticed that these strange new denim releases have slowed down a little these last six months or so, and we’re starting to see a few old classics come back with almost the same amount of shame. Bootcut jeans were announced to be back on the market, much to the dismay of many. Low rise jeans, popular in the ’90s, are also supposedly coming back with about equal feedback from both sides of the coin. Does anyone else remember those oh so hot Frankie B jeans, with that notorious 3″ fly? I think I still have a pair of those, and I still like them. High rise jeans came out to combat the influx of low rise jeans, and became even more popular a couple of years ago, also with almost equal support and hate from both sides of the spectrum. To continue that trend, Levi’s has just released yet another interesting take on it: the Ribcage Jean. Touted as their most highest rise jean ever, these jeans have about a 12″ rise and feature wash names such as “Haters Gonna Hate” and “You Only Live Once.” I guess that’s true in fashion though…there really are no rules, and it’s supposed to be kinda silly and fun after all, right? Another wash name Levi’s used for this new line is “On The Fence,” which better explains my sentiments on rises that high, although I do have several high rise jeans in my closet that I’ve loved throughout the years, including from this brand! Fashion is always changing, and if you’ve ever seen a high couture fashion show, you know it’s supposed to be a bit exaggerated and silly at times, but I don’t think we’ve ever seen that level of crazy so much on the more contemporary side of things. It’s always been about grabbing attention though, and so far that’s never failed. 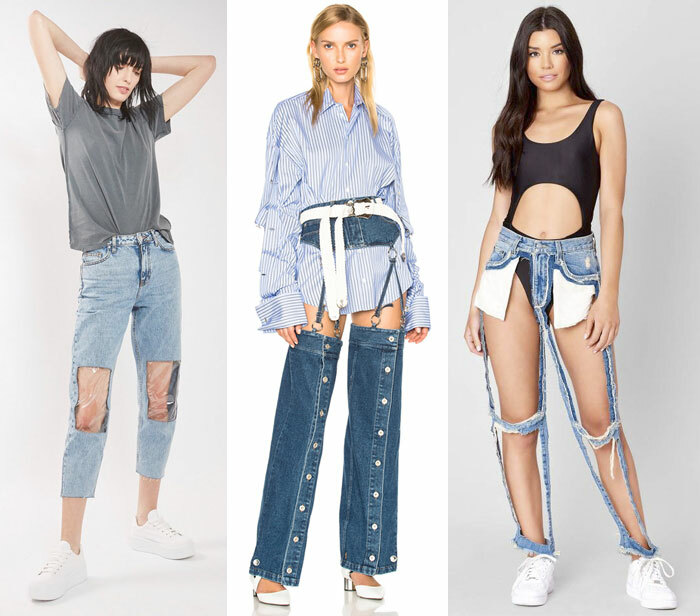 Of course, in the world of high couture, it’s a bit more about inspiring less-than-crazy ideas for future ready-to-wear lines, but what exactly is the idea here with premium denim? It’s hard to say exactly, but you can’t lie and claim that these releases don’t steal headlines. Creativity on the product level alone becomes difficult out there in such an over-saturated market, so maybe that’s what we’re starting to see is that now it’s more about creativity on a brand level—catching attention in a way that for at least temporarily, puts the brand’s name above the others. Are we witnessing some kind of viral hype war between some of these brands? Is this the new state of affairs with the rise of social media? Either way, it’s entertaining (despite the media’s annoying exaggeration about how much people might truly care— For example, “people are flipping out over___” or “people can’t handle___” and my favorite “The internet is stressed out about___”), and no matter how little desire I have to actually own one of these ridiculously crazy items, I can’t help but sometimes appreciate the gung-ho moxie these brands apparently possess.